We’d love your help. Let us know what’s wrong with this preview of George Washington's Spy by Elvira Woodruff. This spellbinding time-travel fantasy makes for a riveting sequel to Elvira Woodruff's bestselling classic, GEORGE WASHINGTON'S SOCKS. When Katie and her twin cousins step into a mysterious rowboat, Matt and his three buddies run to their rescue. But they are too late--and soon the seven are swept back in time--to Boston in 1775. The British have occupied the city, and Geor This spellbinding time-travel fantasy makes for a riveting sequel to Elvira Woodruff's bestselling classic, GEORGE WASHINGTON'S SOCKS. When Katie and her twin cousins step into a mysterious rowboat, Matt and his three buddies run to their rescue. But they are too late--and soon the seven are swept back in time--to Boston in 1775. The British have occupied the city, and George Washington and his troops are planning an attack. While the boys are trying to find their way to the girls after being separated, the boys become entangled with patriot spies. To ask other readers questions about George Washington's Spy, please sign up. I had the privilege of reading this remarkable novel recently, and it has impacted me far more than I expected. I’m a fourth grade teacher at a Title I public school near Charleston, SC. As I was looking for books to use for my teaching next school year, this was not originally on my list because I had not heard of it... oh, but how could I not? I stumbled across it by accident, checked the lexile, and was so captured by the artwork on the cover, that I immediately checked it out of the library. A I had the privilege of reading this remarkable novel recently, and it has impacted me far more than I expected. As I read, I was wonderfully surprised by the details, historical accuracy, perspectives, and themes that emerged. So much of this story could be influential discussion starters. I HAVE to use this story as a teaching tool this year! I’ve created a Donors Choose project in hopes of getting a class set. If you read this review and would like to help donate these books to my classroom, please follow this link. Even $1 makes a huge difference. Thank you so much! Very good, a quick read for anyone over the age of nine, but still an enjoyable one. I think this book is pretty good! My teacher recommended it to me. I like how the are more people on the boat this time. This was a really fun read with my 9 year old stepson. It was funny while also being really interesting from a history perspective. A bit graphic for younger, more sensitive readers. Looking for exciting time travel books for your young patrons or students who've read their way through the Magic Tree House, the Time Warp Trio, and others series of that ilk? Elvira Woodruff's George Washington's Spy might just fit the bill for these readers. A magic rowboat at a lake near their home sweeps fifth grader Matt, his annoying little sister Katie, and four friends from their Nebraska home back to 1776 Boston, where they land in a freezing and dark forest and their magic boat quickl Looking for exciting time travel books for your young patrons or students who've read their way through the Magic Tree House, the Time Warp Trio, and others series of that ilk? Elvira Woodruff's George Washington's Spy might just fit the bill for these readers. A magic rowboat at a lake near their home sweeps fifth grader Matt, his annoying little sister Katie, and four friends from their Nebraska home back to 1776 Boston, where they land in a freezing and dark forest and their magic boat quickly disappears. It's a dangerous time, with the British in Boston and George Washington and his troops trying to drive the British from the city. This is a nice attempt to write a sequel to a near-perfect original. George Washington's Socks is a great time-travel tale about the events leading up to the Battle of Trenton. In her original novel, Elvira Woodruff captured the tension and the humanity of the soldiers during that historic event in a way that young readers of historical fiction could connect and empathize. In this sequel, Woodruff attempts to show that the Revolutionary War was not one-sided with colonists' allegiances solely on This is a nice attempt to write a sequel to a near-perfect original. George Washington's Socks is a great time-travel tale about the events leading up to the Battle of Trenton. In her original novel, Elvira Woodruff captured the tension and the humanity of the soldiers during that historic event in a way that young readers of historical fiction could connect and empathize. In this sequel, Woodruff attempts to show that the Revolutionary War was not one-sided with colonists' allegiances solely on the side of the patriots. She helps her readers see that there were many loyalists who wanted the patriots to fail in their attempts at independence. She also attempts to show the role of spies and the dangers they faced. The plots in this book are not as tightly integrated as they were in the first novel. There is less focus on the members of the adventure club, and there is little evidence of their camaraderie to help each other. Likewise, when the two main plots come close together and could possibly intersect, they remain separate from each other. Finally, the means by which the members of the club return to the present is seemingly rushed and forced. Just like the first book ("George Washington's Socks, which came out almost 20 years earlier! ), the author has done a wonderful job of incorporating an interesting and well-paced story along with historical perspective. While I believe aimed at children in the 8+ range (give or take), both books include partial story lines that are decidedly emotionally and intellectually difficult regarding the reality of war and ethics. However, each also does a very nice job of providing enough information and Just like the first book ("George Washington's Socks, which came out almost 20 years earlier! ), the author has done a wonderful job of incorporating an interesting and well-paced story along with historical perspective. However, each also does a very nice job of providing enough information and grounding for the young reader to both feel for the character and understand the gray lines that are drawn in difficult times. My son is 9 and the difficult passage in "Spy" did affect him - he was very concerned for what happened. But, we took time to discuss the events and the factors involved, which is the point of reading together, isn't it? This story was more adventurous than I hoped. I was hoping for more of a history story, but in the end, everything ended out well. The story takes place in the modern time with Matt, and his friends, twin cousins, and his little sister, accidentally land back in the world of the Revelutinary War. When Matt and his friends are separated from his cousins and sister, he has to find his way back to them, as well as deliver a special message to a certain spy that belongs to George Washington. Meanwhi This story was more adventurous than I hoped. I was hoping for more of a history story, but in the end, everything ended out well. Meanwhile, Katie, and the twins, are residing with a wealthy loyalist family. Everyone is suffering through the pox, and one of the family’s daughters catches it. Katie suffers from a broken ankle, while the twins, Lilly and Emma, are trying their best to reach home but are unable to get a signal. In this book, the gang from George Washington's socks goes on another time travel adventure with the addition of two new friends. Matt, Q, Tony and Hooter are back with Katie, Emma and Lily. They arrive in the Boston area just prior to the Battle of Dorchester in 1776. The boys and girls get split up with the boys landing with rebels and the girls with a Tory family. Through their eyes, we see both sides of the conflict, the terrible injustices and the hardships of the time. I didn't like this bo In this book, the gang from George Washington's socks goes on another time travel adventure with the addition of two new friends. Matt, Q, Tony and Hooter are back with Katie, Emma and Lily. They arrive in the Boston area just prior to the Battle of Dorchester in 1776. The boys and girls get split up with the boys landing with rebels and the girls with a Tory family. Through their eyes, we see both sides of the conflict, the terrible injustices and the hardships of the time. I didn't like this book as much as the first one. It was a bit drawn out at times and slow moving - although so was 18th century life and the travel of news. There was a lot of learning here for my kids as they saw the life parallels between then and now. And of course, a peek at the events of history from ground level. I loved the fist book in the series because it is a great book for getting Magic Tree House lovers up to a higher level. I like this sequel better than the original as a history teacher I'm always trying to get kids to think about perspective. In this book, the time traveling kids end up on opposing sides. The girls end up with a family of loyalists and the boys end up with a team of patriots. This story does a good job of balancing perspective. In this adventure the club travels further back in time to the battle of Dorchester where General Washington's men claim the high ground above Boston by taking the cannon captured at Fort Ticonderoga and dragging then to the Dorchester Heights. Ok, technically a time travel story, but I'll consider it historical fiction. Great for boys! Ten-year-old Matt and six other children travel to 1776 Boston, living out American history as they meet Benjamin Franklin, learn about colonial medicine, and become part of a rebel spy ring. This novel is excellent for fifth graders, though somewhat violent. It shows a true perspective from both sides of the war, and shows how it was a civil war, with families torn apart and the bad guys and good guys difficult to pinpoint. 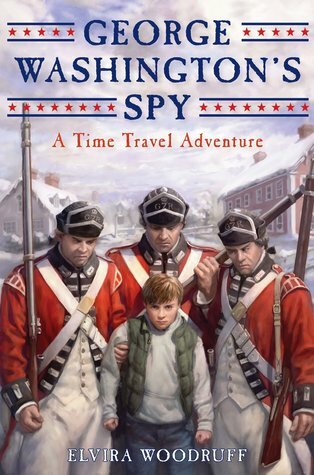 A good imaginative story about a group of children who travel back in time to the Revolutionary War period. I read this story out loud to my class. This was better than the first one! A nice introduction to historical fiction for young readers. My favorite part is when one of the kids lets Ben Franklin wear his sneakers! It's cute! B was on the edge of his seat. Made it easy to get him to read every night. Found this a little slow going so have put it aside. My 8 year old son really liked this. I think I'll read it some day, but thought I'd give it some stars until then.